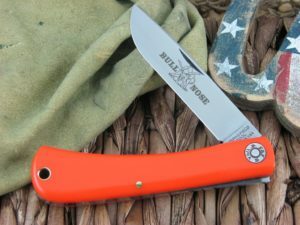 This is the Great Eastern Cutlery Farm & Field Bullnose Sodbuster, has Natural Canvas Micarta handles and Steel liners. The blade steel is 1095 and finish is Satin. There are a few sharp edges on the pivot pin and and the edge needs some love but other than that this knife is jam up! I have ordered three so far and absolutely love them! I love the GEC bullnose. Wish they made them in stainless like Case does. But this is probably the nicest sodbuster I have ever seen. I love the natural canvas micarta. Great knife. I love these 71s this years run has the stoutest pull of any previous run that i have. This is typical gec f&f, well made and strong. The only problrm i have with the last 2 year runs is the fact that the handles are not as slim and shapely as they used to be. They are a little too thick and blocky for me but this is still my 2nd most favorite model of gec knife. Overall a great buy! Solid build! There are a few sharp edges on the blade pivot rivet – not uncommon on F&F knives. These are easily smoothed with some fine grit sandpaper. Everything else on the knife is perfect. 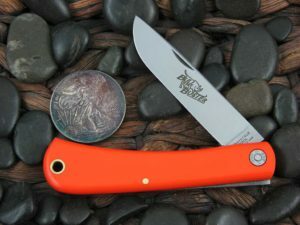 The bullnose is the very first GEC knife i ever purchased. I’ve bought at least 10 since then. I love the thickness of the scales, the super hard snap with strong pulls. It’s a great size but not too large. And last, in my eye, HANDSOME to a fault!! Thank you Mike and Bill! This is a great way to experience a great knife at a very reasonable price. Carbon steel, comfortable handles, excellent quality. You will be hooked on GEC. 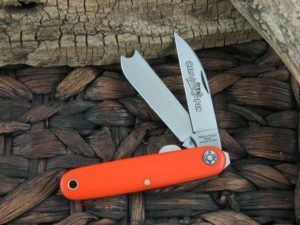 I’m a big fan of GEC knives, and own several models. They are known for having stiff pulls on most blades, and this one is definitely no exception. The thing that really disappoints me regarding this particular model is the sharp/rough edges on the ends of the pivot pin. The one I received does not even allow you to lightly rub the knife without snagging and tearing your skin on the pivot pin. Normally I would take some fine sandpaper and dull these edges, but with this F & F model I’m hesitant to attempt this- because I don’t want to scar up the embossed washer directly behind the ends of the pivot pin. 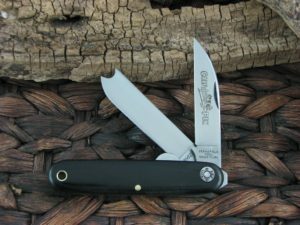 These “Farm and Field” knives are ideal for us curmudgeons who like the old time stuff… A bit small, but handy in the pocket… The fit and finish is good, but not exquisite… Be prepared to knock a few sharp edges off the pivot pin.. It will, most likely, be a bit sharp for us old, thin skinned yahoos with soft hands like me… I did mine in about 5 minutes or less with some 1200 grit cloth… I rubbed the micarta a bit to slick it as well… But, overall, the little knife is great… Sharpened him up, and he is in the pocket now… Highly recommended… Now we need a “big” one to go with it…!!! Normal GEC fit and finish. Nice stiff pull. The natural canvas micarta is great. Great mustard color and it feels smooth but with a little grip, different than linen micarta which I like as well.